New Zealand is one of the most beautiful countries in the world full of impressive nature and adrenaline rushing activities for all seasons. Although a small country, there is so much to see you need a least a few weeks in each island. If you are short on time, I would recommend just focusing on one island to ensure you don’t rush and miss some of the best experiences. 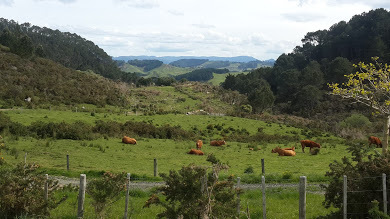 I spent 3 weeks in each island and went with the Kiwi Experience bus tour who I would highly recommend if you are by yourself or unsure of where to go. You can buy passes which can cover various areas of both islands at http://www.kiwiexperience.com. In the north island, the beginning of your trip will usually start with Auckland. A lot of backpackers dismiss this city however if you get out of the city centre and explore there is a lot of beautiful things to see and do. Check out my guide to Auckland for more information. Situated 4 hours north of Auckland, this is a tropical paradise that you can’t miss. Most people stay in Paihia, the main town in the Bay of Islands, however there are many beautiful surrounding areas. On the way there, make sure to stop at this beautiful waterfall. 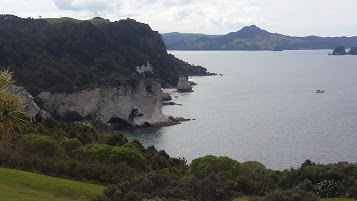 If you go with Kiwi Experience, their default itinerary only allows for 2 nights in Paihia, however I would strongly recommend staying up to a week, especially in summer as the weather is beautiful. Make sure you book your bus back to Auckland in advance as they fill up quick! Russell is a tiny island off the coast of Paihia and is even more remote and beautiful. Ferries run a few times an hour from the pier and return up until 11pm. Here you will find several restaurants along the waterfront and this is a great spot to watch the sunset. Several times a week there is a local crafts and food market next to the main street on Marsden Road. Here you can find delicious local wine, cheese, produce and meats as well as listen to some live music. Just a short drive from Paihia, Kerikeri is another beautiful area making a great day trip. Visit Rainbow Falls and take a nice bush walk. If you don’t mind the cold, bring your bathing suit and have a swim! If you have a sweet spot, Makana Chocolate factory is a great place to visit. You can watch all the delicious treats be made on-site and buy them from the store. They also have lots of free tastings! This is the best way to see the beauty of all the islands and sealife. There are plenty of day tours that take you through the bay of islands which often include dolphin watching, fishing and other activities. They are quite expensive so I would encourage you to try to meet and make friends with locals as they are often out on the water and may have boats themselves. But if the tours are your only option for seeing the islands it is completely worth it. You may even get lucky and see some dolphins! Cape Reinga is the northern most point of New Zealand and here you can see the meeting of the Pacific Ocean and Tasman Sea with the beautiful lighthouse. On the way you can stop at 90 mile beach and do some sand boarding! Kiwi Experience will book you into X Base in Paihia, however they are at least 5 other hostels on the same street (Kings Road) which are cheaper, smaller and cosier so I would book somewhere else a few days in advance. I stayed at Peppertree Lodge as it was the cheapest on the street and it had free kayak hire and a great quiet kitchen and lounge room. The bar at the Base hostel is the place to be for both backpackers and locals and is busy every night in the summer and weekends in winter. 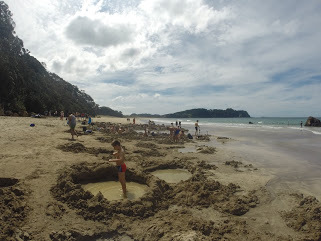 After the Bay of Islands, the next great place to go would be back past Auckland down the Coromandel coast to Hot Water Beach. If you’re on the Kiwi Experience, you start your tour leaving Auckland by meeting the bus bright and early at 830am on the main street in town, Queen Street. This will be easy enough as you can spot the mounds of nervous and eager backpackers lingering around the meeting point. There is a short introduction by your driver guide who you will instantly fall in love with due to his crass and friendly sense of humour. 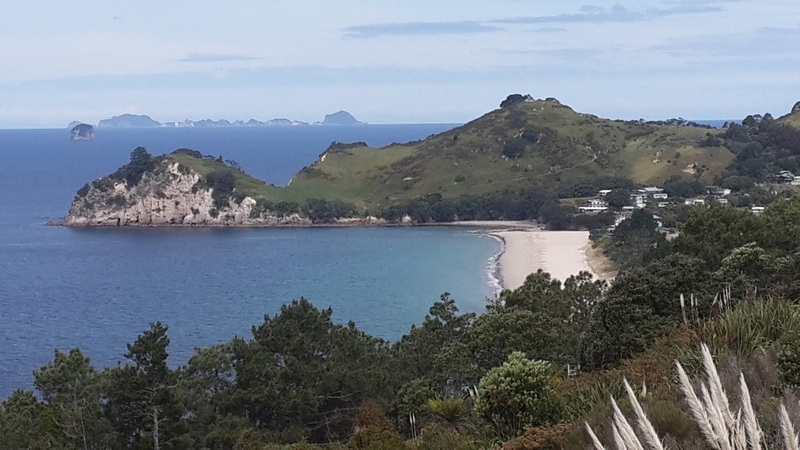 The next few hours are spent driving around the beautiful Coromandel Peninsula until you arrive at Hot Water Beach, rated one of the top ten beaches by Lonely Planet. 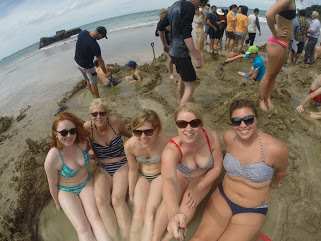 Here you can rent a shovel and dig your own hot water pool in the sand! 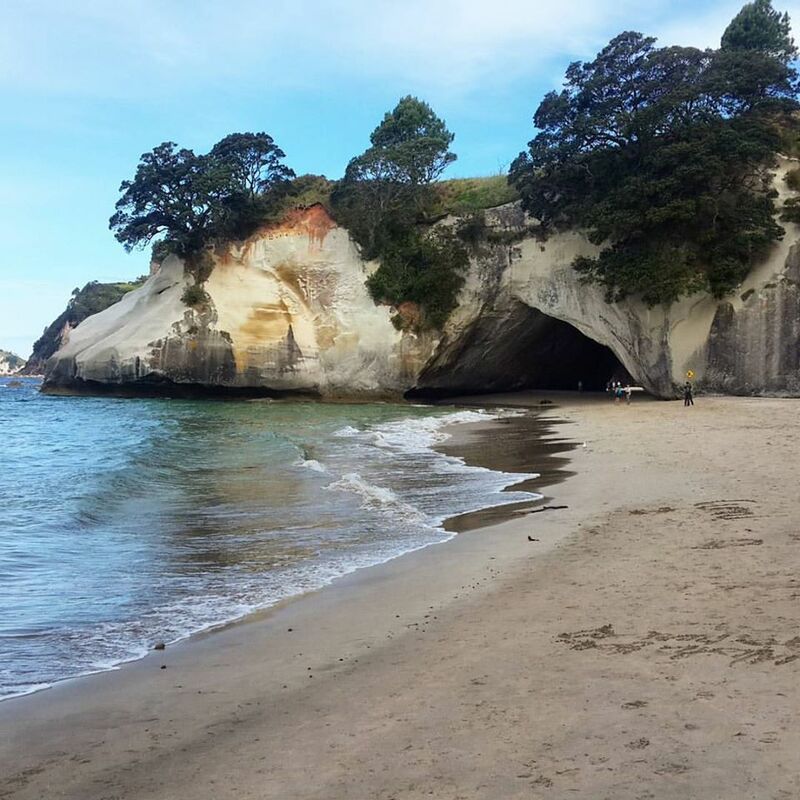 If you’re a Narnia fan, you will definitely recognise Cathedral Cove, a peaceful paradise beach. You can kayak there for $85 or take a nice walk for free which covers both coastal and forest views. You should spend a bit of time here marvelling in the beauty. After dark, head back to the beach via the walkway from the camp ground and you will see an array of glow worms in the bushes. 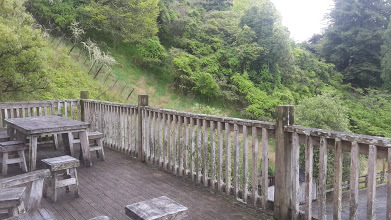 There is not much by way of accommodation and if you’re with Kiwi Experience you stay at Hot Water Beach Holiday Park in cabin dorms for around $30. There is a communal kitchen to use and you make supermarket stop on the way. Otherwise, there is a Fish and Chip shop there which has huge and cheap servings for under $10. 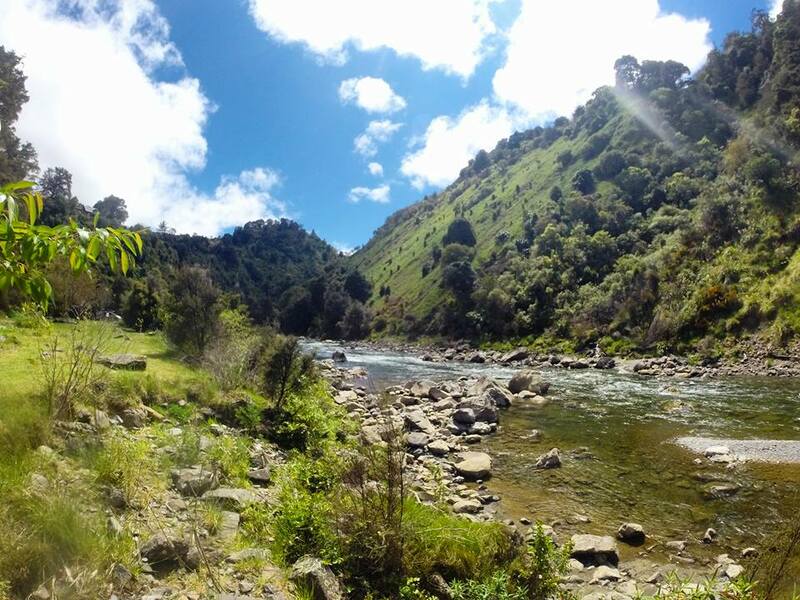 From Hot Water Beach you can drive to the Kopu Ranges and take a walk through the Karangahake gorge. This used to be a gold mine and the walk will take you across two eery swing bridges and through caves where the gold was transported. After this you go to Waitomo (water hole in Maori), the town of limestone caves filled with glow worms, stalagmites and stalagtites. 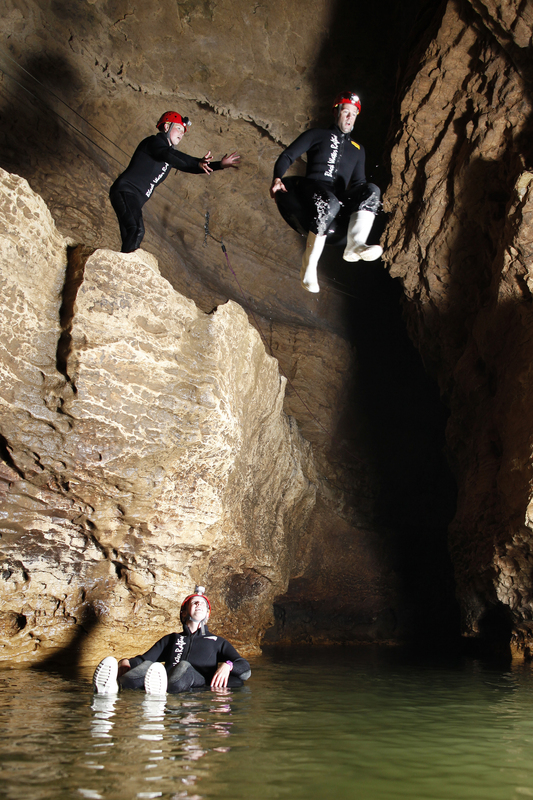 These are hidden beneath the valleys and you can take black water rafting tours into the caves. If you’re on a super tight budget and can’t afford a tour there are several walking trails you can take on foot. However I must say this is an incredibly unique experience and is definitely worth it. 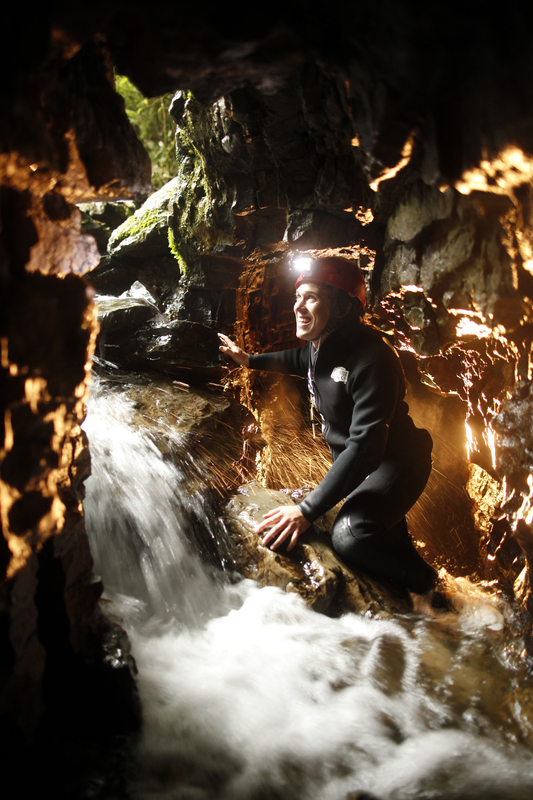 If you’re on a budget, you can take the Waitomo Glowworm Cave and Ruakuri Cave boat tour for $40 and $57 respectively. However if you want some adventure I would recommend spending an extra $50 or so and go on the Black Labyrinth tour for $112 which goes for 3 hours. Here you climb down into the caves, jump off waterfalls and tube around all the tunnels with rushing water surrounding you, whilst staring up and admiring the glow worms. 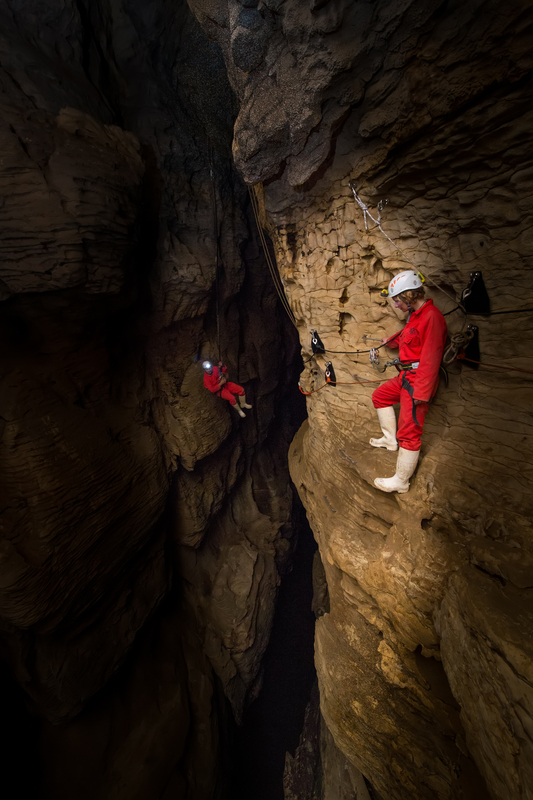 If you want even more adrenaline, you can try the Black Abyss which includes a lot more climbing up waterfalls, abseiling and flying foxes in the caves! It goes for 5hrs and costs $190. Alternatively if you’re not so keen on getting wet, you can do the Black Odyssey tour which is essentially a high ropes course within the caves, high above the water. It also goes for 5hrs and costs $150. At the end of each tour you are treated to cups of warm soup and bagels which is exactly what you need after hours in the cold water! 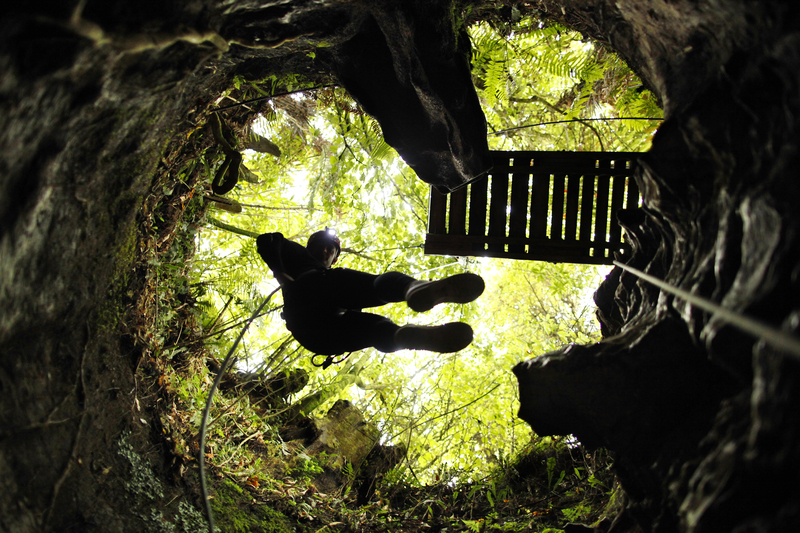 This takes up most of the day and is the main activity to do in Waitomo. 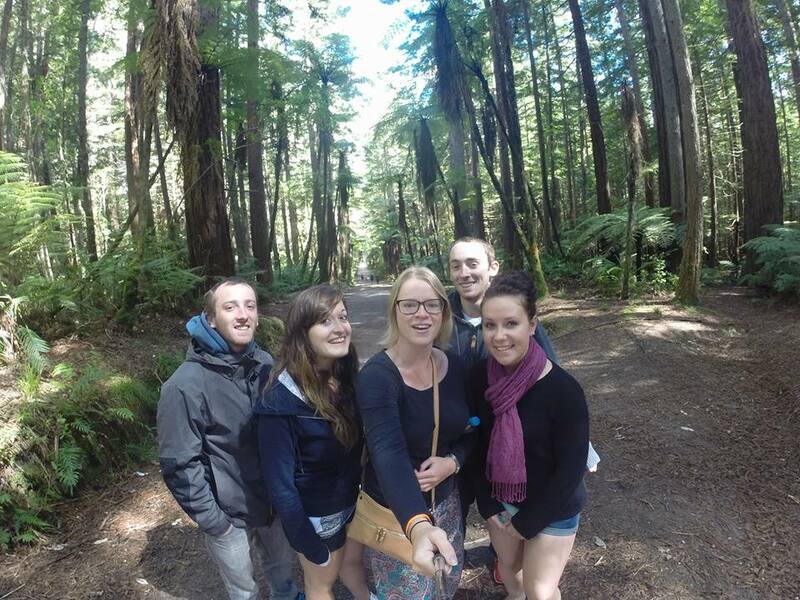 If you’re with Kiwi Experience you stay at Kiwi Paka in motel/hostel type accommodation. There is a huge kitchen (however there is a $10 deposit on cutlery), shared bathrooms and dorms with single, two or four people ($32 for four). There is a pizzeria which serves great pizzas, however they are expensive with a small starting at $15. If you want some drinks, head down to Curly’s Bar which is just a crawl away to try their craft beer and ciders and hang out with your bus crew or locals.This bar is usually pretty busy until 12am. 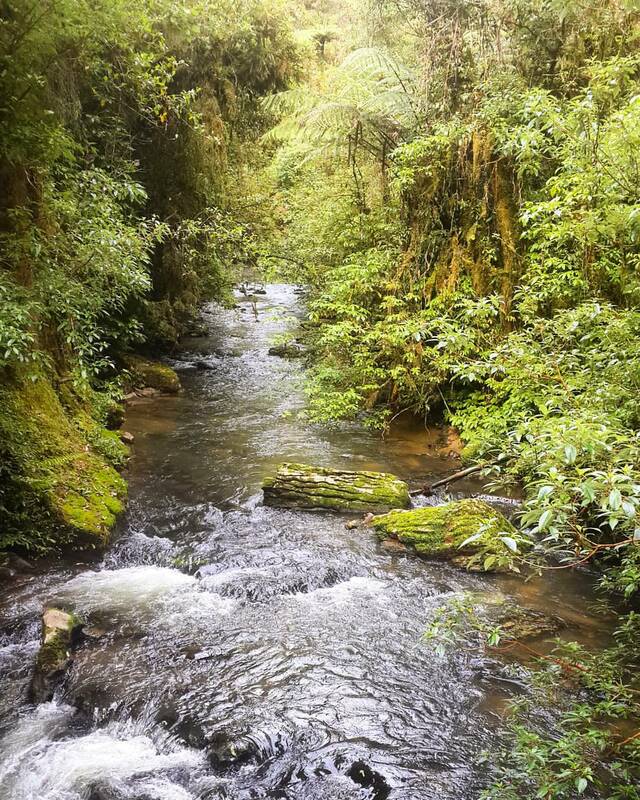 As you are leaving Waitomo, you can start the day with a relaxing rainforest walk through the Ruakuri Reserve which takes about half an hour. Following this on the highway you will reach the Hobbiton Movie set. You can do a guided tour of the area with all your favourite scenes in 2hrs for $90. Those who are not doing the Hobbiton tour will be driven straight through the beautiful mountains to Rotorua, whilst the others will arrive by shuttle after the tour. For something free to do, from the centre of town take a nice walk around the edge of Rotorua lake heading south. 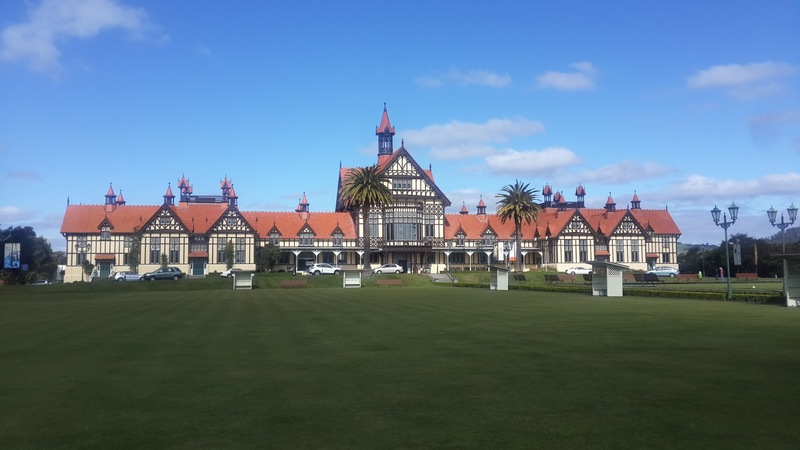 You can then walk through Government Gardens, home to Rotorua Museum. 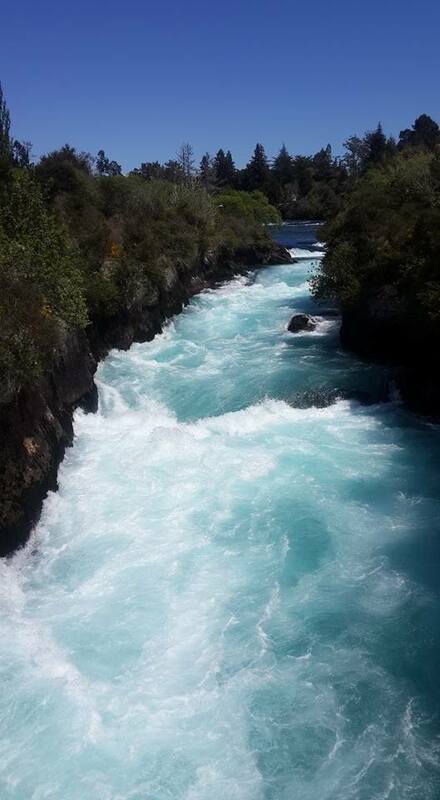 On this walk you will see and smell a lot of sulphur and geothermal activity in various parts of the gardens. 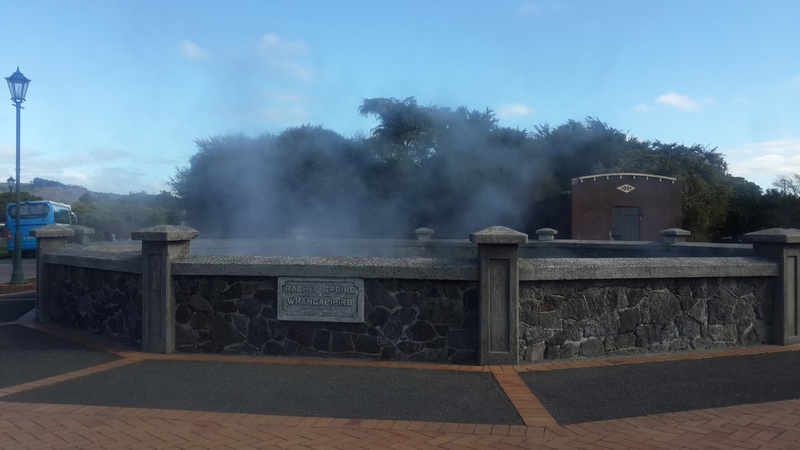 There are two geothermal spa options in Rotorua; the first is the Blue Baths which is situated in the Government gardens. It is around $11 for entry and is one large spa, with impressive architecture. The second is the Polynesian spa, which costs $24 for entry, and if you can afford the extra is completely worth it. It has 7 beautiful pools with varying temperatures to soak in. 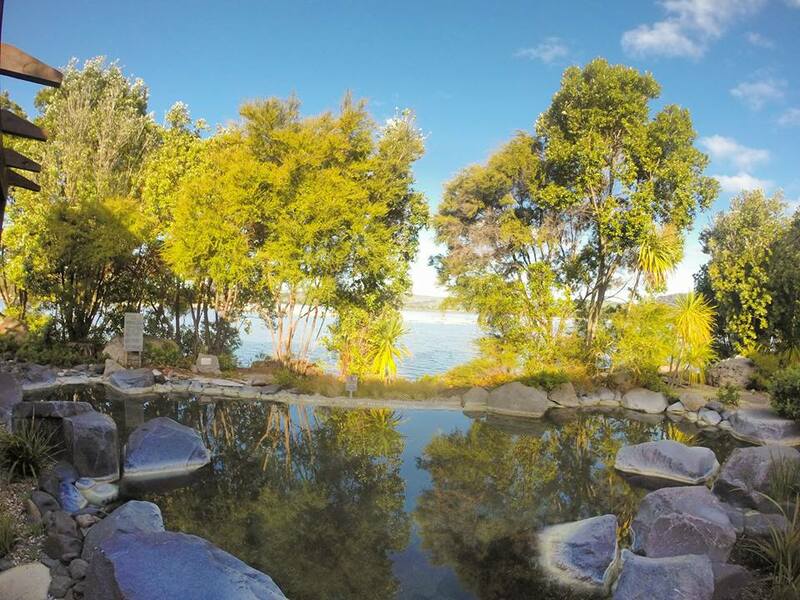 For $40 (usually $45 however Kiwi Experience gives you 10% off) you can purchase the ‘Deluxe’ spa experience which includes locker hire (usually $5 anyway), a towel, showers with full toiletries and hairdryers, access to 7 rock pools which adjoin lake Rotorua. After days of rushing around sightseeing and early mornings, spending an afternoon in the spa is exactly what you may need! Head to Skyline Skyrides to take either gondola up over the city or some fast paced luge rides. You can buy a package for both the gondola and 5 luge rides for $47, or $25 for just the gondola. This is something really fun to do with friends as you race down a track in a tiny yet speedy car (think of dodgem cars but smaller). It is around 4-5km from town so to get there you can take a local bus from the city centre easily for a few dollars. This is an incredible insight into the Maori history and culture with an evening spent at the Tamaki village. Here you are guided into their village, but first you are presented with a jaw dropping opening ceremony performed by the Maori men. Once inside the village, you visit several huts, each which aim to teach you a different part of Maori culture from weaving to the hukka. Following this, you are shown the traditional way the maoris cook dinner. By this point you are extremely hungry and are ready for the incredible all you can eat feast! The evening ends before 10pm and you are taken back to your hostel by bus. However this is not any regular shuttle bus, it is a party bus with karaoke songs played at full strength. It costs $87 for the evening and you can choose to stay there overnight in one of their huts for around $170. If you’ve never heard of zorbing, it is essentially where you are put inside a giant inflatable ball and roll around with your friends. 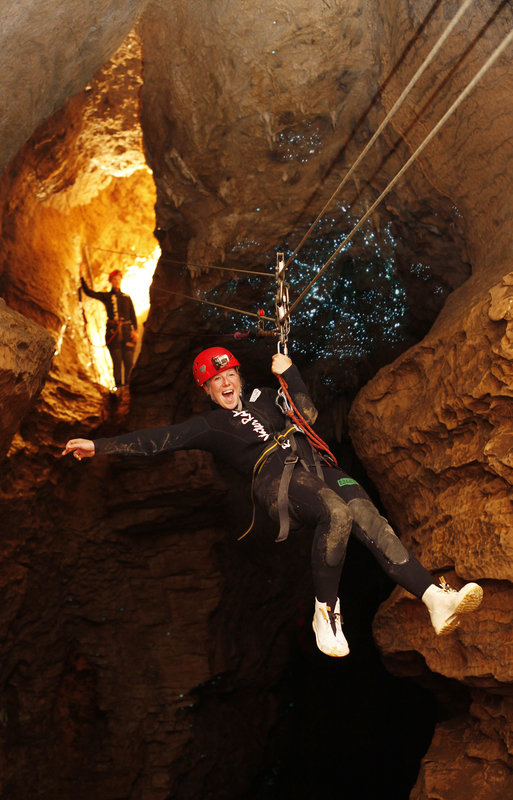 It is pretty epic and is something you can do at Rotorua for $40. 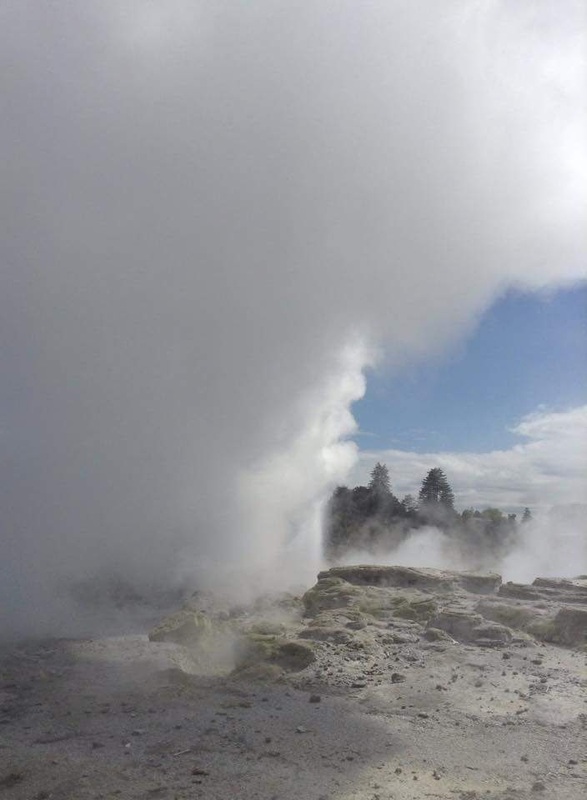 This geothermal reserve has the biggest geyser in New Zealand and is incredible to see erupt. It is $30 entry which also includes access to the many mud pools, a kiwi bird house and a Maori arts and crafts information centre. 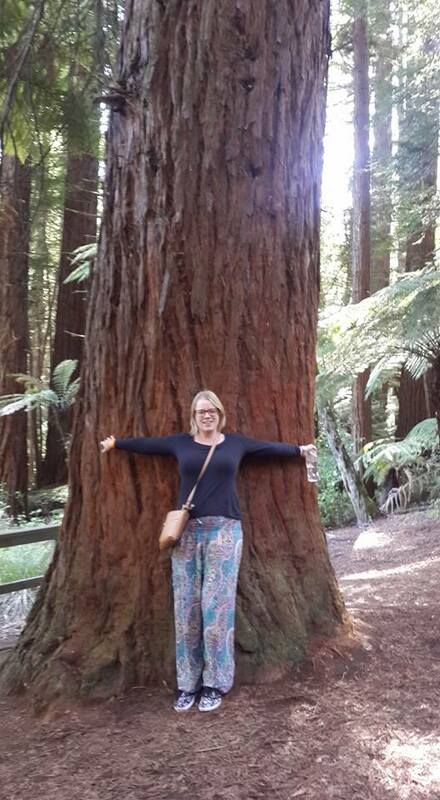 Just past the Te Puia reserve, this beautiful forest has several easy or moderate walks you can take with HUGE Redwood trees all around. If you’re with Kiwi Experience you will be staying at Base hostel in the city. The rooms are decent with ensuites, the kitchen is big with a nice balcony to eat on and they have a free geothermal pool to hang around! Wifi is $6 a day or you can pay $18 for the week to use at other Base hostels around the country. If you’re staying at Base, they have Lava Bar connected to it. This has pool tables, a nice decking and super cheap drinks ($5 for basic spirits until 11pm). If you’re on Kiwi Experience they will only book you in for one night here. However there is a lot to do and is definitely worth 2 or 3 days of exploring. 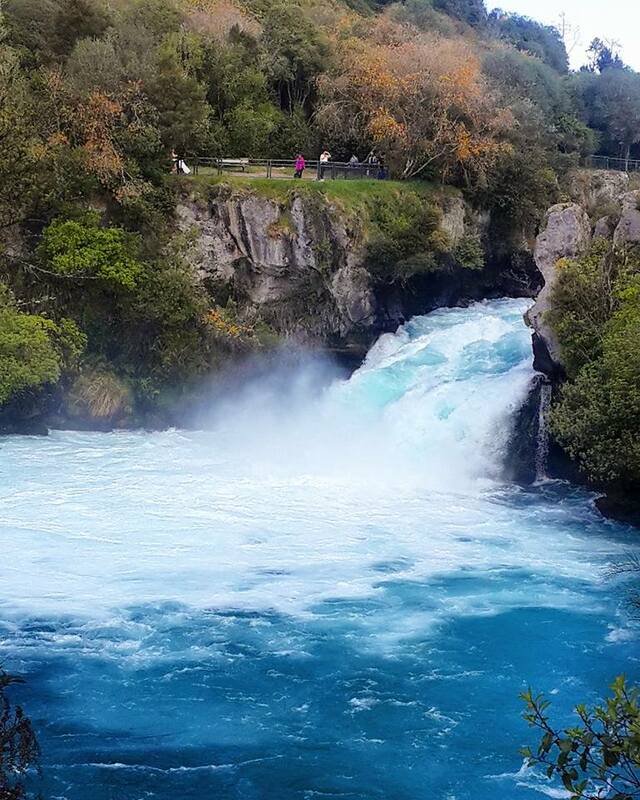 You can take a short walk to the Huka Falls on the Waikato River for a gorgeous view of 11m high rushing waterfall. At the beginning of the walk there is a Spa Park with free geothermal spas. 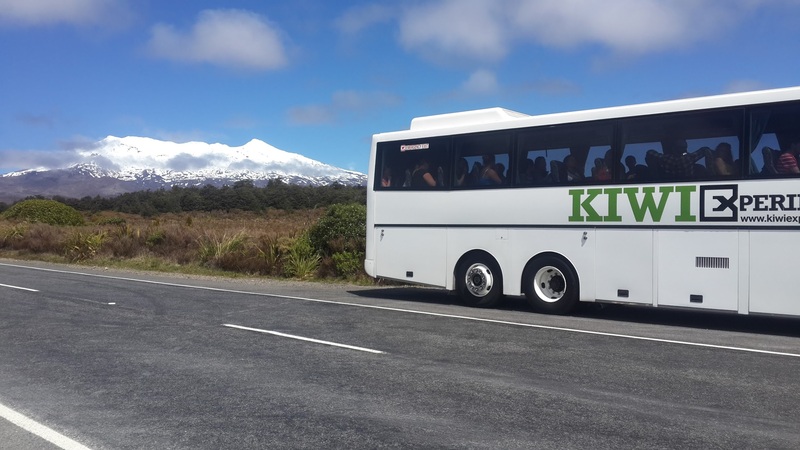 The Kiwi Experience bus doesn’t stop for the spa however it is worth checking out. 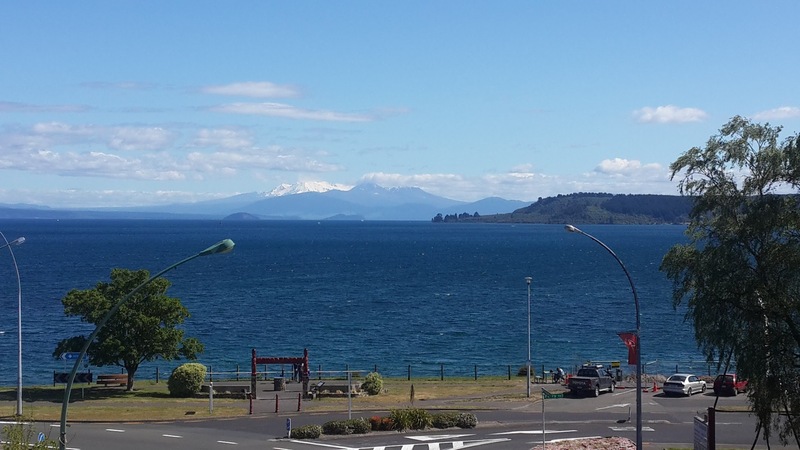 Lake Taupo is 616 square kms and is the largest freshwater lake in Australasia. Along here are a mound of cafes and restaurants where you can sit, dine and enjoy the view. 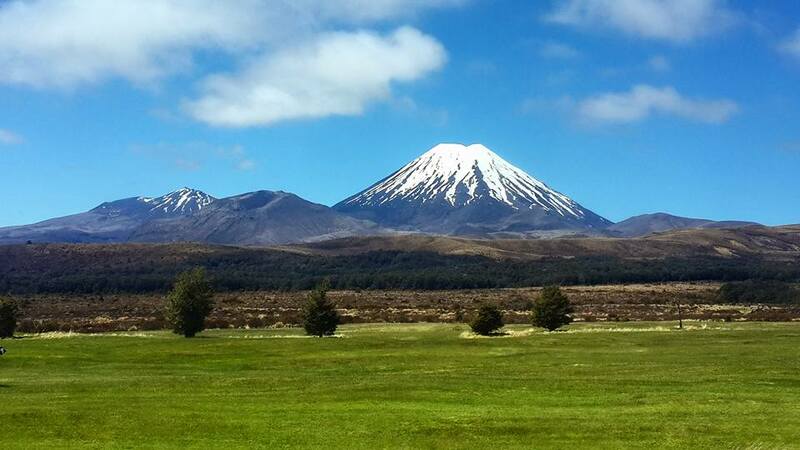 You will see Tongariro National Park and the snow capped mountain of Mount Doom. This is the most popular place to skydive in the North Island and you get incredible views of the lake below you as you jump. You can do it for $250 for 12,000ft or $340 for $15,000ft. This is quite expensive (especially if you add on photos and a video) and if you’re planning on going to Australia you can skydive in Cairns and Airlie Beach for $200 at 14,000ft. If you enjoy hiking, this is your jam. 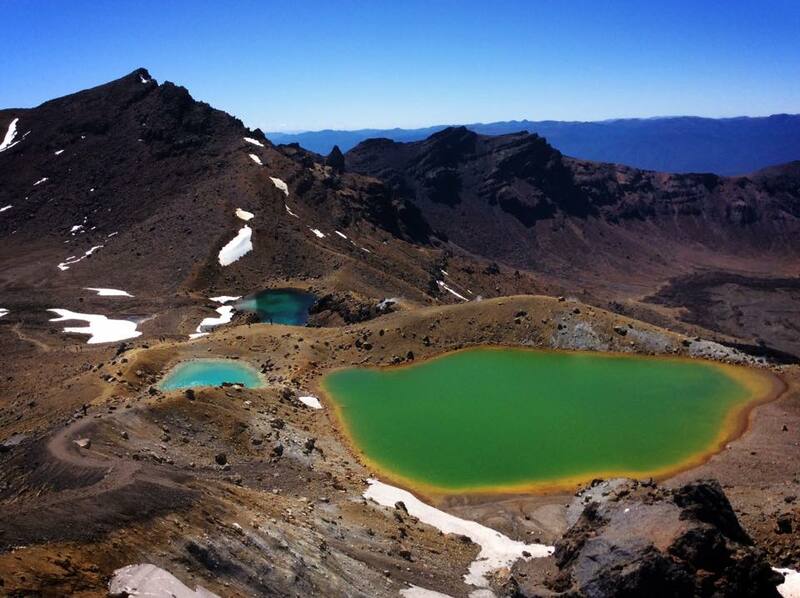 The Tongariro crossing is a 22km one day hike which is a part of a larger 4-5 day hike in Tongariro National Park. It is ranked in the top ten one day walks in the world. This boasts absolutely phenomenal views and landscapes include snowy mountains, volcanoes and craters. If you don’t mind getting up at 5:45am, it is definitely worth the $65. However it might be worth training a bit beforehand with a bit of exercise, as people I know who did it were exhausted for days afterwards. 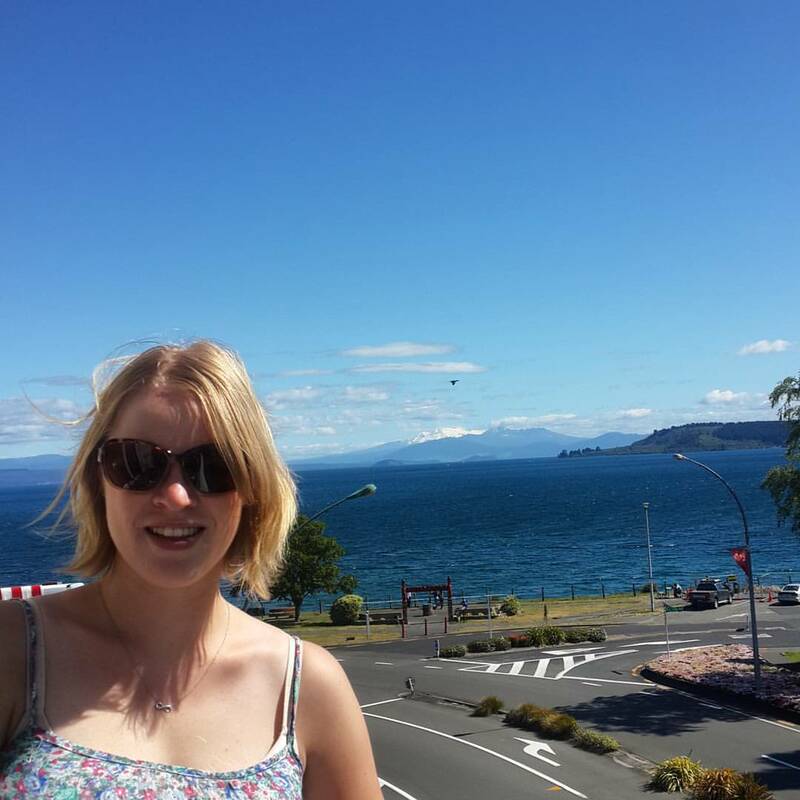 You can also relax and enjoy a great 2hr sailing cruise on Lake Taupo. Kiwi Experience will advertise the ‘Sail Barbary’ for $40 which includes free pizza and you can bring your own alcohol. However I found a better deal with ‘Ernst Kemp Cruises’ on a steamboat. 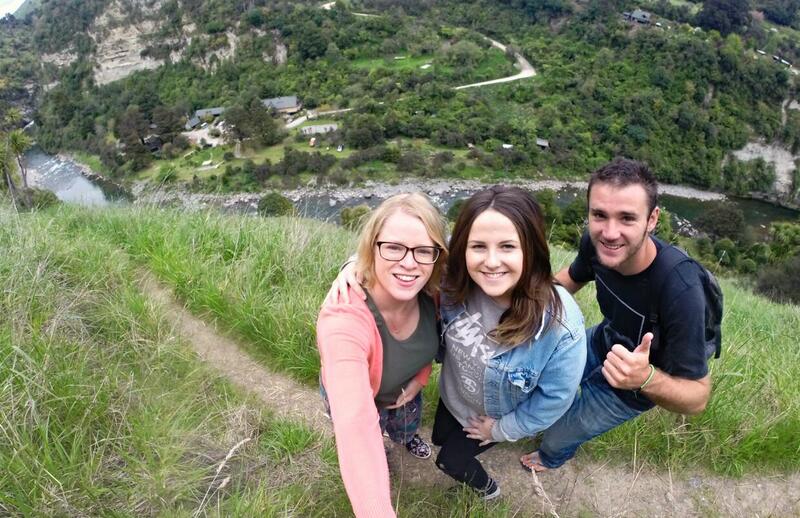 These take you to the Maori rock carvings and if you get a 5pm session it includes free unlimited alcohol as well as cheese and meat platters for $35! 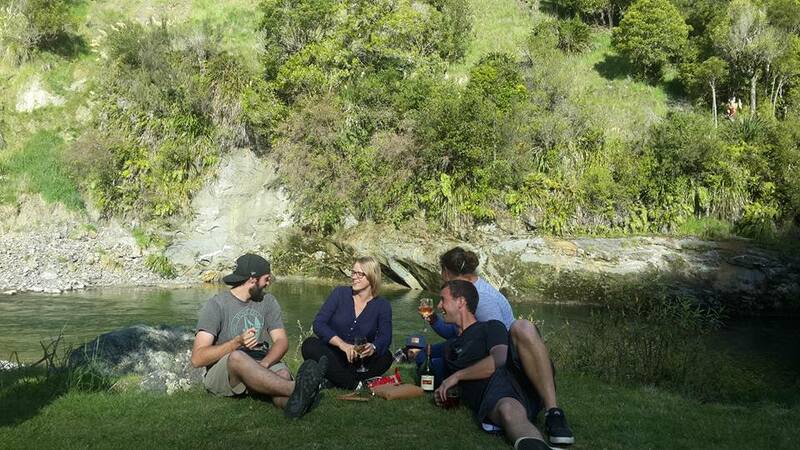 This is a beautiful way to take in stunning scenery while relaxing with friends. If you go with Kiwi Experience you will stay at Base hostel southbound and Urban Retreat northbound. Base is right in the centre of town and has a great bar. Try to request rooms 304 or 305 for an incredible view over the lake, an ensuite and free tea and coffee with a kettle for $30! If you want somewhere quieter, I would strongly recommend Urban Retreat. It has 4 bed dorms and a nice community feeling with a common room and a relaxing outdoor terrace. There is also a super cheap bar selling $3 wines! Base hostel has a connected bar called Element which gets pretty busy on weekends and has cheap drink specials. Otherwise, head across the road to the Irish pub Finns. On the way out of Taupo you can stop in Tongariro National Park to do some great small walks to lookouts of the famous Mount Doom and beautiful landscapes featured in the Tongariro Crossing. 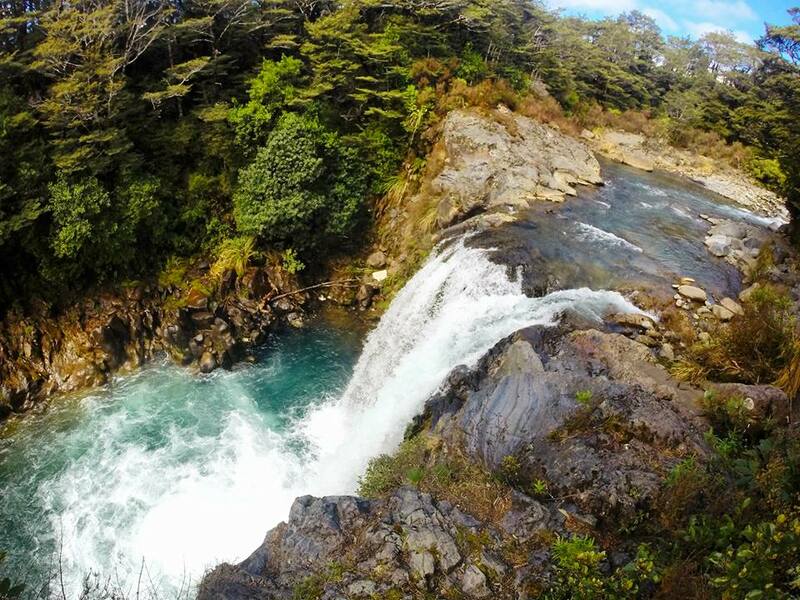 You also do a walk to a beautiful waterfall used in the filming of Lord of the Rings. 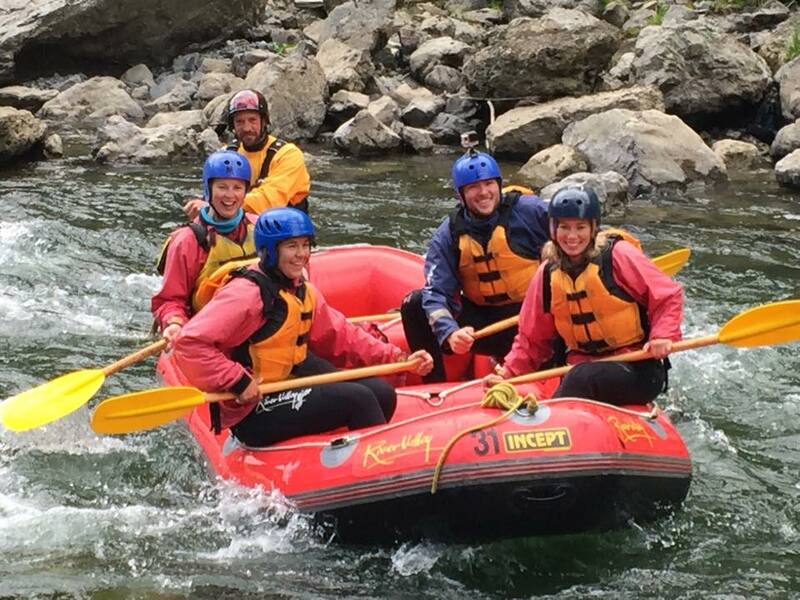 This is a great place to do white water rafting and has grade 4-5 rapids and for $160 you spend half a day on the rapids. It’s tough work however very exhilarating! If you like cliff views, there is an incredible walk you can do right up to the top of the valley. First you need to cross the river using their human trolley, then take the steep man made path to zig zag up the mountain. The views from the top are incredible. As soon as you enter River Valley lodge you will be instantly relaxed by the calm surroundings. Grab a drink and sit by the water with your friends to watch the sunset, it’s truly remarkable. You can also spend half a day on horseback trekking through the beautiful Lord of the Rings countryside. This is great for both beginners and advanced riders, as you are initially taught skills with the horses and can then test them out on some jumps and roam around on your own, as opposed to a restricting nose to tail trek. This place is extremely unique in that the lodge is built around the functioning of the river rafting. It is therefore the only accommodation around. You can choose between regular 4 bed rooms for $31 or be daring and sleep in the 32 bed dorm for $25 with no partitions between mattresses! They serve delicious dinners for $15 and breakfast as well if you aren’t in the mood for cooking. The lodge has a bar which is open until about 12am and everyone just drinks in the main common area playing bar games. This was one of the best nights on the trip. This is a free museum and could easily occupy you for a full day. This is something great to do on a rainy day (there are quite a few of those in Wellington). This is a short uphill walk south east of the cit that reveals an incredible view of the city from the top. 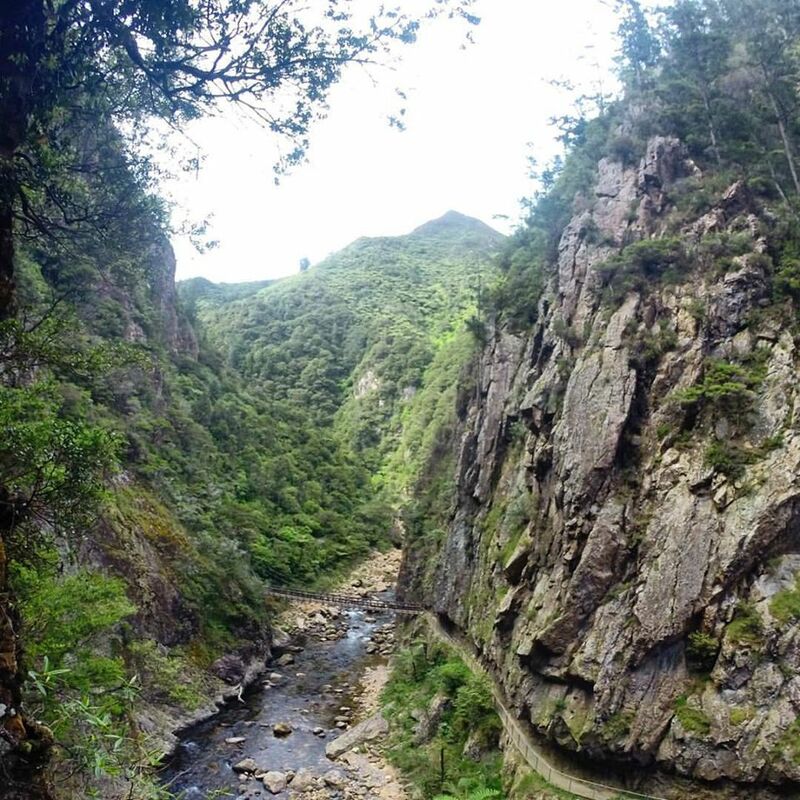 There are several walking tracks you can take on the mountain which are very picturesque considering you are just 5mins from the city centre. From here you can walk back down to the centre with great views of Oriental Parade beach. 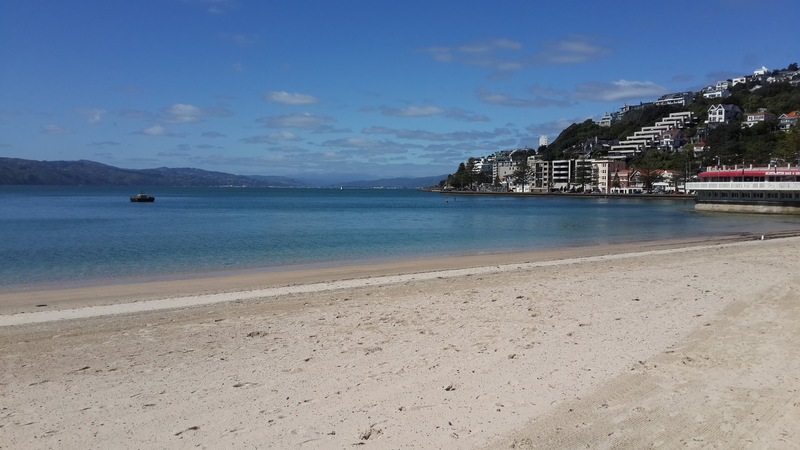 Though the stretch of beach on Oriental Parade is small, it is still a great place to sit and relax on a nice sunny day. If you enjoy waterfront dining, check out BlueWater Bar and Grill for a nice meal and a decent price. You can take a scenic cable car up to the botanical gardens which is a great spot for coffee or some lunch in the sun whilst admiring the view. 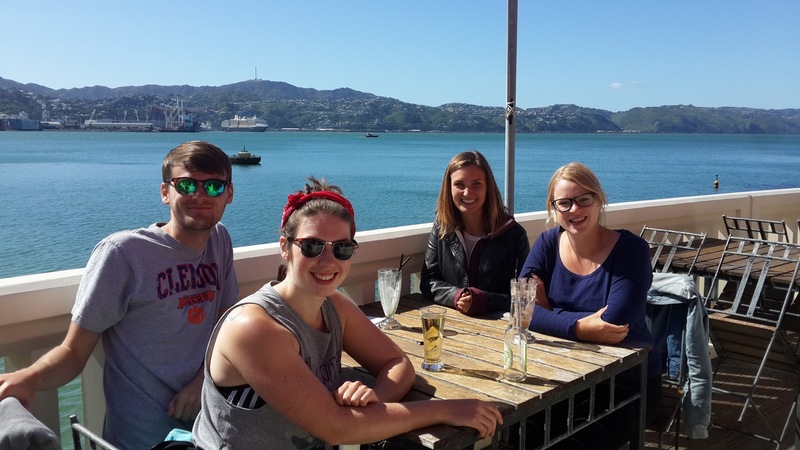 If you go with Kiwi Experience you have the option of staying at Base hostel in the town centre. There is a free dinner and a bar downstairs with super cheap drinks. Otherwise, you can stay at YHA or Nomads hostel. Nomads has free pancake breakfast and dinner each night for those keen on saving some money. The bar at Base, ‘Basement Bar’, has extremely cheap drinks to start the night off ($4 basics). From here, head to Cuba Street for some retro bars. This entry was posted in kiwi experience, New Zealand, North Island and tagged auckland, bay of islands, budget, budget travel, caves, caving, chocolate factory, dolphin watching, geyser, glow worms, hot water beach, kiwi experience, luge, mount eden, mud pools, nature walks, new zealand, north island, paihia, river valley, rotorua, solo travel, taupo, tour nz, waitomo, waterfalls, wellington. Bookmark the permalink.